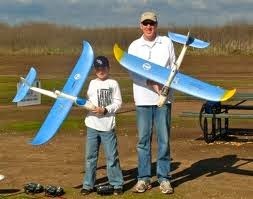 Many of us will be "celebrating" this long holiday weekend with picnics and other family outings. As you go about your weekend I hope you will join me in pausing to remember the real significance of this holiday, HERE. Monday we recognize those millions of men and women who have given their lives in defense of this country. Those of us who have proudly served this country in the military have a pretty good understanding of the sacrifice it takes. The families of those men and women, like Costa Mesan Jose Garibay, who lost their lives during military service have the REAL understanding, though. Each year I write about this holiday. HERE is what I wrote last year. Take a moment to re-visit that entry, and listen to the video clip at the end. This year please take a couple moments to watch this current clip and recognize the brave men and women who so proudly served this country and gave the ultimate sacrifice. 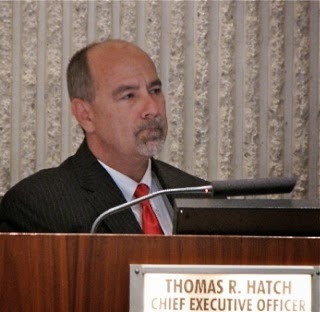 Here's the short version of events from the Costa Mesa Parks and Recreation Commission meeting last night that was held before an audience of fewer than 25 people at the peak. Right off the bat the four commissioners on the dais - Don Harper was absent - chose to re-appoint the existing leadership. 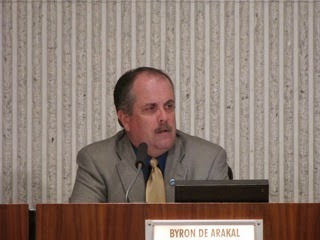 Byron de Arakal will remain as Chairman and Kim Pederson will remain as Vice Chair of the commission. In my view, that's a good thing. Byron has demonstrated that he's a strong leader and Pederson sits at his right hand, occasionally offering subtle stabilizing comments. One of the major items on the agenda was the Athletic Field Use and Allocation Policy, HERE, which was dispatched promptly when it was agreed to bifurcate the subject of lighted fields from the main body of this agenda item. Community meetings will be held during the summer to try to resolve the issue. In the meantime, it was agreed that Woodland, Kaiser, Lindbergh and Back Bay schools would remain as possibilities for lights and Harper School - which currently has lights but was scheduled to be "rotated out" this time around - will remain on the "lighted list". de Arakal received assurances that if agreement can be made with the School District to light any or all of the other four schools, that Harper would be dropped. There were three (3) tree removal requests on the agenda. One, on Bismark Way, was continued a month. In the case of the other two, the commission rejected the staff recommendations and approved the removals requested. Nearly an hour was spent discussing the Capital Improvement Project budget and the result was the recommendation to the City Council to add into the budget nearly $1.5 million in items not included this year in the Preliminary budget. The biggest ticket item was the conversion of Field #1 at the Jack Hammett Farm Sports Complex to artificial turf, thus allowing its use all year long. Other items involved studies in elements at Fairview Park. We'll see how receptive the City Council is on those issues. At one point, when emphasizing his perception of the need for more playing fields, de Arakal said, "We don't have enough lighted fields despite what some of those armchair statisticians think." Earlier, when the commission was discussing the possibility of buying the Balearic Center from the School District, he said, "We should not be spending a ton of money on capital improvements on property we don't own." After a short break at 8:25 they reconvened to discuss the 19th Street West project, HERE, which covers the area along that major street from Newport Blvd., to the end of 19th Street. 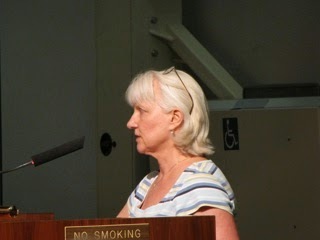 A half-dozen residents spoke on the issue and most were supportive of the improvements planned. The plan was approved. 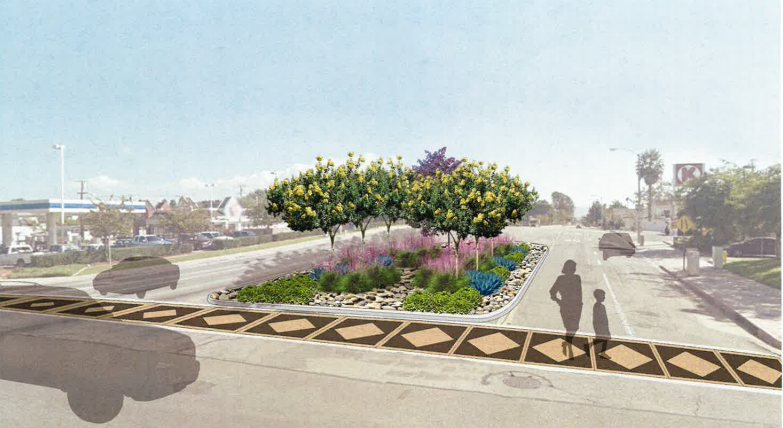 After a short discussion the commissioners agreed to support the "simulation A" version of improvements for the stretch of Del Mar Avenue east of Newport Boulevard. Last on the agenda was the East 19th Street "improvements", which are really methods of slowing traffic along that corridor from Irvine Avenue to Newport Boulevard. There is $855,700 in Grant Funds available to do this project. Approvals should occur and design will begin by August of this year and construction will begin early next year. Those of us who live on the Eastside are concerned that it may result in more cut-through traffic along parallel streets, like Costa Mesa Street and Flower Street. Much discussion was held on the various suggestions for monument signage for this area. The commission asked the staff to return to the drawing board, since nobody seemed interested in any of the suggested styles. At the end of the meeting de Arakal played a preview of a video production created by Costa Mesa Television on "Bikeability" that will begin appearing on CMTV in the normal rotation on June 4th. There was one person in the audience to see that film - me. the meeting ended just after 10:00 p.m. - a long night for the Parks and Recreation Commission and another long night for the staff. Tonight the Costa Mesa Parks and Recreation Commission will meet at 6:00 p.m. in City Council Chambers at City Hall for the regular monthly meeting of that group. You can read the agenda HERE. Following the election of officers, HERE, the commission will launch right into what is probably the most interesting, and potentially contentious, issue of the evening - the Athletic Field Use and Allocation Policy Recommendations, HERE. The changes will be recommended to the City Council for approval. That 35-page staff report includes minor modifications to the policy - the re-naming of the new Parks and Community Services Department - to major changes to the definition of user groups. It also includes a red-line version of the new policy so the changes are quite evident. The staff recommends that the commission NOT include the issue of portable lights, but that studies should be made during the summer and that issue be brought back at a future meeting following those studies. Next up are three requests for tree removal - 2550 Fordham Drive, HERE; 2721 Cardinal Drive, HERE and 1164 Bismark Way, HERE. The staff recommendation in each case is to deny the request. Item 10d is the request for a granite dedication stone at Estancia Park Sepulveda Adobe, HERE. The Costa Mesa Historical Society has requested this stone be placed in the park by the "Native Sons of the Golden West", with a dedication ceremony on Saturday, November 15, 2014. Item 10e is the Capital Improvement Budget for the period including fiscal years 2014/2015 - 2020-2021, HERE. Included in the staff report is more than 30 pages from the current proposed fiscal year budget dealing with Capital Projects. The commission will consider the budget proposal and make recommendations to the City Council for their approval next month. Item 10f is the concept plans for West 19th Street, HERE. 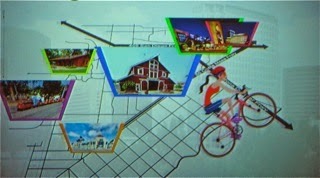 The commission will consider and approve the concept plans as presented. 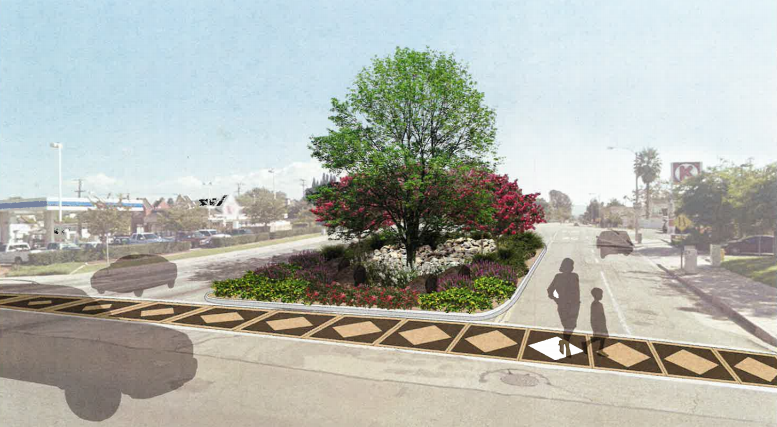 Item 10g is the Del Mar Avenue Beautification Concept plans, HERE. The commission will be asked to approve the conceptual design. Item 10h is the East 19th Street Landscape Plans and Monument Signs project, HERE. You will recall that there have been community meetings on this issue at which the strangulation of the traffic along that stretch of roadway from Irvine Avenue to Newport Boulevard was discussed. 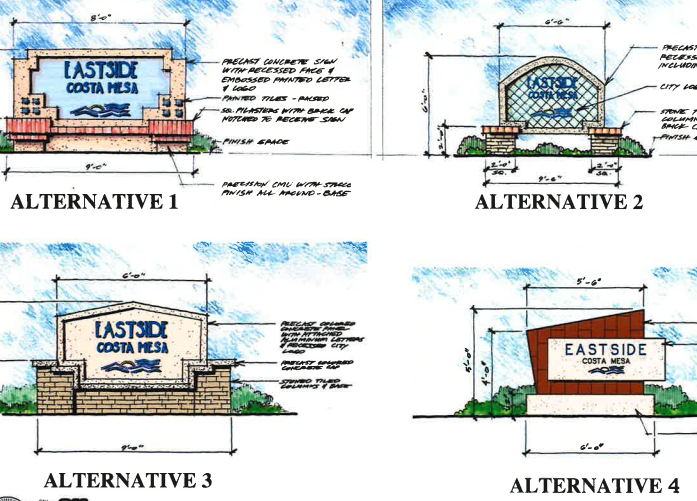 The commission will be asked to approve the concept and one of the monument sign options. It's going to be a long night tonight - again. Join me watching your government in action and express your views to the commissioners on these many important issues that will affect the lives of most Costa Mesa residents for decades to come. 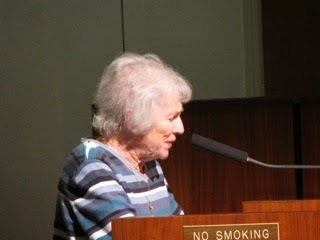 According to several sources on Wednesday, a group of Costa Mesa women who have been actively opposing the proliferation of rehabilitation homes in their Eastside neighborhoods have been served with notices from high-powered law firm, Rutan and Tucker, demanding that they cease making comments about their clients - a local real estate agent, his firm and another company and individual - on Internet comment threads. Apparently this springs from a recent posting of addresses and ownership details of presumed rehab homes gleaned from public records searches that list the real estate agent and associates as owners of the properties and the subsequent comment thread on that issue, PLUS a semi-related recent comment thread on a Daily Pilot story about Rehab homes. The law firm demands that the women, among other things, write a formal apology to their clients and post corrective language on the threads involved or they will be sued for defamation, libel and slander. Several of the recipients have told me they will be consulting with attorneys today on this issue. Even more disturbing is the fact that a high-ranking city appointee has apparently been involved in this issue - posting his own comments on at least one of the threads and recently taking personal, aggressive action with some of the women involved. One curious element of this story is that one of the women who received the papers is not a participant on either of the comment threads in question - but she has had differences of opinion on a variety of issues with the appointed official I mentioned. It makes one wonder what is actually behind this legal action, at least in her case. IS THIS A "SLAPP" SUIT? We presume that the law firm is quite serious about this situation and that it is not just a SLAPP suit. In either case, it will certainly put a chill on community activism and may be another attempt to silence critics in this city. I have no idea what kind of advice these women will get from their own law firms, but I suppose we may hear about it eventually. Yes, I say "women" because no men have been reported as receiving the letters. Yes, I know the names of some of them. Yes, I know the name of the appointed official. No, I'm not going to share that information right now. When Mayor Jim Righeimer announced that the renewal of the Harbor Soaring Society agreement was being continued until a future meeting I thought for a moment we might have an early evening last night. Then, when he announced that the issue involving the Conditional Use Permit for the Sandpiper Motel would be moved to the end of the meeting my thoughts turned to "Well, he's going to clear the decks for a long item."... which turned out to be accurate. 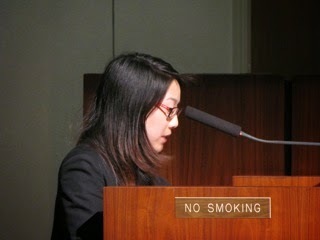 Ten people spoke during Public Comments, meaning that none were trailed to the end of the meeting early this morning. Subjects ranged from need to create policy dealing with displaced residents as a result of new housing replacing old housing (Harold Weitzberg); the need for further study on the issue of a new library (Charles Mooney read Eleanor Egan's letter); the Military Affairs Team collection for the 1/5 Marines, the budget workshop, the need for space for the Veterans and possibly swapping the Senior Center building to be used as a library (Beth Refakes); the need for more animal control officers (Al Melone); Dan Joyce was a scapegoat (Chuck Perry); Crime, not enough cops (Robin Leffler); 2447 high density units have been considered by Righeimer since he joined the council and that he puts development before residents (Chris McEvoy) and the 60th Anniversary Celebration scandal (Teresa Drain). During Council Member Comments Mayor Pro Tem Steve Mensinger began by assuring folks that he was 100% behind a new library, then cautioned folks that it's an election year so people will be commenting who want no change. His statement was, "As you listen to the drumbeat of the partisans who want to talk about problems in the city remember it's a pro forma for the election." Basically, he was telling the audience to ignore speakers. Typical! This from a guy who can't bother to pay attention to the proceedings during the meetings. Sandy Genis mentioned the Chamber of Commerce awards to student scholars, the Library Foundation, Memorial Day services at Harbor Lawn Cemetery on Monday, John Wayne Airport issues are regional issues and thanked the Costa Mesa Fire Department for 1) extinguishing the recent fire at Talbert Park and, 2) thanks for supporting the San Diego firefighting efforts. 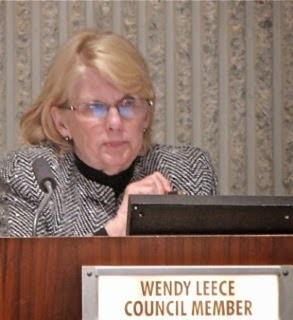 Wendy Leece also addressed the library issue and suggested the possible use of large rooms at the Senior Center and the Costa Mesa Golf Club to supplement the Neighborhood Community Center; the Parks and Recreation Commission should address Dog Park issues; the need for a Veteran's venue. She also provided a snapshot of our legal fees for the past couple years. Jones & Mayer cost us $1.386 million in FY 12/13 and has cost us nearly $1.4 million so far this year. Jones Day has cost us over $1.7 million working on the CMCEA case while Liebert Cassidy Whitmore has been a bargain at $290,000 last year. Righeimer told us his recent trek to Las Vegas - he returned earlier that afternoon - was very successful and that the staff will produce a report on it soon. He told us "The Senior Center is going to be fine. 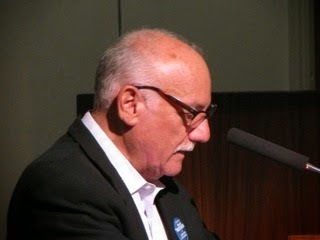 ", and that the current Board is just overwhelmed by the issues facing it. He said "Professional Management", plus $500,000 in the budget for next year, will help. He told us a new library would cost $35 - 50 million. Responding to a letter by Air Fair in the Daily Pilot, and addressing the "regional needs" of the airport, he said, "We have to be sure we do what's best for our city." He refuted the criticism by speakers observing that we don't have enough police, said the Chief (Gazsi) is doing a great job recruiting and that the police just got another 4% raise. During his segment CEO Tom Hatch mentioned that three public safety members were honored recently. Scott Purcell was named firefighter of the year; Michael Cohen was named Police Officer of the year and Scott May was named Supervisor of the year. In response to a question by the public he told us there was a place on the city web site to offer suggestions for the upcoming Charter discussion on June 3rd - the final public hearing on the issue. 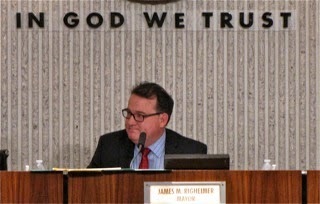 After Righeimer moved the Sandpiper issue to the end, the discussion began on the two items involving the 240 apartments that will be built near John Wayne Airport, at 125 East Baker Street. Three people spoke against it. Robin Leffler said a contiguous manufacturer has said they're moving out, recognizing the signs that will eventually push them out. 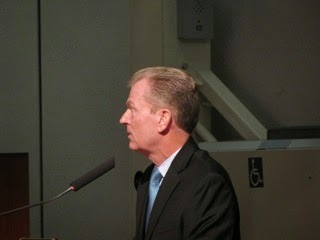 Leffler bemoaned the loss of yet another manufacturing business and referred to "helter skelter zoning". Others cited the lost opportunity for affordable housing. Both items passed on 4-1 votes. 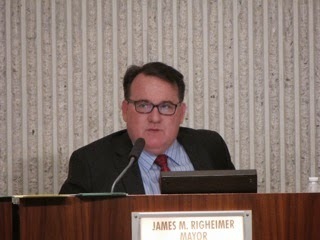 The discussion then turned to the General Plan Screening request for 236 luxury apartments at the location of the current Costa Mesa Motor Inn - one of Righeimer's infamous "problem motels". It seems the owner of the property has apparently "seen the light" - those are actually probably stars from being bludgeoned by code enforcement, law enforcement and fire inspections - so he wants to build apartments with golf course views. Former Director of Development Services Don Lamm - now a shill, er, spokesman, for developers - spent the first couple of minutes of his presentation praising the council for its leadership and vision, blah, blah, blah. It was embarassing. I thought for a moment that he might jump up on the dais and give each one of them a big hug, for goodness sake. After that pandering was over he went about telling us about the proposed project - which actually seems pretty nice, except that it's on Harbor Boulevard and will eliminate lots of affordable housing. However, Lamm told us that they have NO long term renters. Funny, that doesn't seem to fit with what we've been told by city staffers in the recent past. 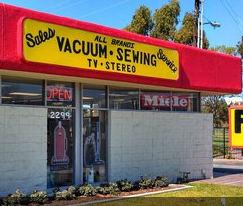 Sandy Genis inquired about the vaccuum cleaner shop that occupies a small section of land that seems to hamper a proper project. She was told that negotiations are ongoing with the owner to buy the property, but that he has cell towers on it that produce income for him. Righeimer chimed in that somebody needs to talk with him because those towers will become very ineffective once the new building is built. So, another long-time business will be squeezed out. Several speakers addressed this project. Weitzberg observed that this may be an opportunity to provide more affordable housing - a thought that was echoed by several other speakers. In fact, one suggested that it become 100% affordable. Cynthia McDonald spoke with eloquence, bemoaning the loss of good businesses to development, citing the need to diversify so we don't have to count on South Coast Plaza Sales Tax revenue so heavily. She observed that the density of this project - 59 units per acre - nearly triples the previous benchmark of 20 units per acre south of the 405 freeway. She also observed that it perpetuates the imbalance between home owners and renters in the city, and that we would be getting NO park fees from this project. She cited a need for a long-term strategy. WHAT HAPPENED TO MERCY HOUSE? Margaret Mooney wondered what happened to the Mercy House affordable housing plan. Nick Melvin, who manages the Harbor Center across the street from the proposed project, expressed joy at the prospect of the new apartments. He cited high crime - presumed from the Costa Mesa Motor Inn - in his center. 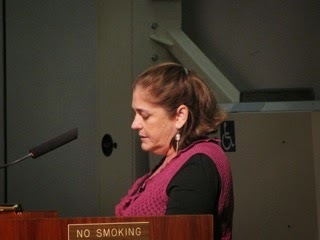 Kathy Esfahani, representing the Costa Mesa Affordable Housing Coalition urged the council to STOP, and listen to the comments. 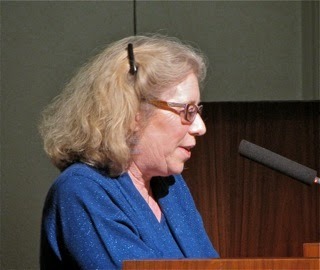 She urged them to look beyond the needs of the rich (developers) toward the needs of the community. Jay Humphrey observed that this project will reduce the inventory of affordable housing in the city and that it will set a precedent for 5-story developments throughout the city. 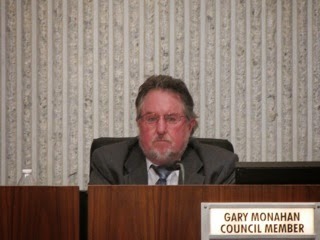 Gary Monahan, still in the auditorium, made a motion to accept the plan (Mensinger seconded) and when Leece began to express a view he tried to cut her off. 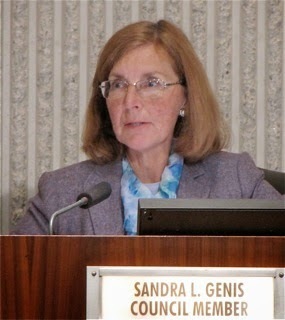 Genis suggested it could prejudice the General Plan before it's completed and also suggested that, just as the COIN process provides transparency in labor negotiations, there should be some mechanism to provide the same transparency in these kind of transactions. Mensinger said this was not a place anyone should have to live in - he used the word "despicable" and cited 150 square foot rooms and described those who own such places as slumlords. I'm sure the owners felt good about that characterization. Righeimer told us the current model for housing doesn't work and that we already have density. He suggested meeting with Esfahani to talk about the issue. Then, talking about the residents of the Costa Mesa Motor Inn, he said, "These people are not residents of Costa Mesa - they come in for a week to get a fix on drugs." After more discussion the vote was taken and it passed, 4-1, with Genis voting NO. 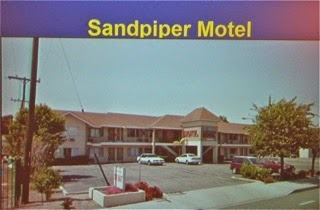 Finally, after a short break and the departure of Monahan who left because he had a conflict - his bar is just across the road from this motel - the council reconvened at 8:50 p.m. to begin the discussion of the appeal of the Planning Commissions revocation of the Conditional Use Permit for the Sandpiper Motel, which would have changed it's authorization for long-term housing from 40% to 25%, the current code for all other motels. When the commission revoked it I wrote about it HERE. Last night went about the same and took about three and a half hours to do it. I'm NOT going to try to cover every word spoken on this issue last night. I will try to give you my sense of the proceedings. First, Righeimer reached a point where he chided and scolded the owner of the motel as being a bad manager, not knowing how to run his business and on and on. Since this was an appeal of the Planning Commission's decision to revoke the Conditional Use Permit, it became what is known as a de novo hearing - starting from scratch. Since I sat through the whole thing before I knew we were in for a long night. A court reporter was making a record - just as had been the case before - and a lawyer from Jones and Mayer presented our "case", assisted by one of our code enforcement officers who worked on the case. After that the lawyer for the owner took over and presented their views. A "DRIVEWAY" TO MORE DEVELOPMENT? Some may recall that the contiguous Rolling Homes Mobile Home Park - a senior living cite covering nearly 3.5 acres - was prime for development last year when it was discovered during THAT General Plan Screening process that there was no access to the property, so it died. If this project is successful it could pave the way - literally - to development of the mobile home park - a point more than one speaker mentioned. In fact, Genis included that observation in her wrap up. Eleven speakers addressed this project. Many, again, spoke about the loss of affordable housing. Others speculated about just why this motel was being tagged with the "nuisance" tag when there were NO police reports as part of the public record. Calls for service fell right in the middle of the array presented a few months ago during the Nuisance Ordinance proceedings. Finally Leece moved - Genis seconded - that the council reverse the revocation, citing the lack of findings to support the revocation. During her comments following her second of the motion Genis said our lawyer had said this was "a first step", and she wondered toward what? She also observed that it appears to be a "campaign of inverse condemnation." 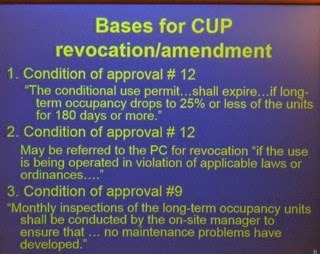 She suggested that the "first step" was to condemnation of the property and declaring it a "nuisance" in the CUP revocation resolution paved the way for future condemnation. During the discussion Leece asked Righeimer how he squared his "small government" positions with what they were about to do here - micromanaging a private business. She wanted to know how that worked. Righeimer said, "Thank you for the political statement. ", which made me laugh outloud! 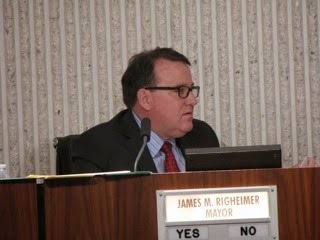 If there ever was a political pontificator from the dais, Jim Righeimer is the guy! He said, "This is exactly what government is supposed to do!" Leece said, "So, it's OK for the government to tell this man how to run his business? ", to which Righeimer replied, "Absolutely!" 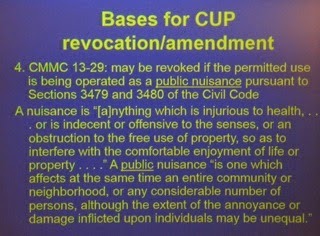 CUP REVOKED - SANDPIPER A "NUISANCE"
OK, you've got the idea. 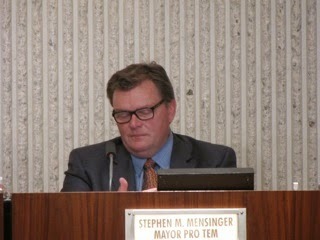 The vote was taken on Leece's motion to reverse the Planning Commission decison. It failed, 2-2. 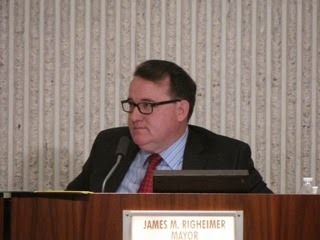 Then Righeimer moved to uphold the Planning Commission decision and the vote was also 2-2, which means no decision and the Planning Commission decision is upheld and the conditional use permit is revoked - and the Sandpiper Motel is now tagged as a "nuisance" - which could be the death knell downstream. That item finished at 12:30 and one speaker in Public Comments warned us of creeping radioactivity before the meeting finally adjourned at 12:35 a.m. Ugh!